Question: Does My Scary Zombie Halloween Mask Have Unsafe Levels of Lead? This is a 2003 Zombie Mask by “The Paper Magic Group” out of Pennsylvania. It is “Made In China” as many of these items are. Rule of Thumb: In general, I always assume that Halloween gear might likely be toxic in some way or another unless it is specifically sold and marketed for use by young children. 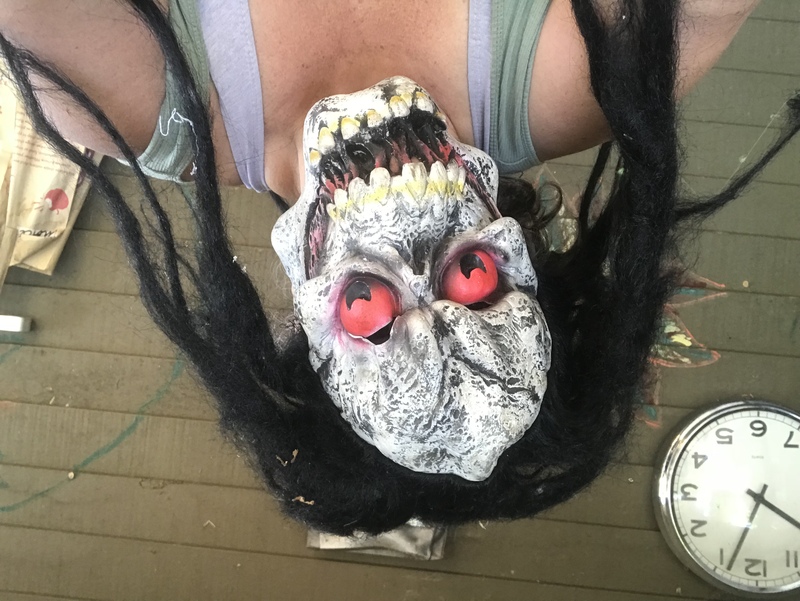 For more Halloween gear that I have tested, click here. While this particular Zombie mask did NOT test positive for lead, cadmium or mercury, it DID test positive for trace levels of Arsenic (As), and extremely high levels of Antimony (Sb). Please note that several tests were done on each component of the mask, with correspondingly various XRF test results. Some areas of the mask showed lower levels of Antimony (Sb), but I have chosen to share the results with the higher Antimony levels – to demonstrate how extreme and concerning these levels can be. For a #SaferChoice for Halloween makeup for kids, click here. To see more things I have tested with an XRF, click here. Below are the exact XRF test results of the mask pictured. If a specific element is not listed in a section below it is because the reading for that component of the mask was “ND” (Non-Detect) for that element when tested with an XRF instrument. What this means is that if there is any trace of that element it is below the single digit ppm detection limit of an XRF designed specifically to test for toxicity in consumer goods. This equates to an effective “negative” for that element when discussing potential toxicity in consumer goods. Do you want me to test more masks? Chip in here in support of my independent consumer goods testing and lead poisoning prevention advocacy work! Thank you! *If you purchase something after clicking on one of my affiliate links I may receive a small percentage of what you spend at no extra cost to you! Thank you for supporting my advocacy work in this way! #AskTamara: Do “Mermaid” Reversible Sequin Things Have Unsafe Levels of Lead?